Edward Gorey once said, "I suppose I know a few tots who would like my books." In his day the man perfected the art of the macabre, helping to raise whole generations of children with a taste for the darkly humorous. Kids who continue to indulge such tastes have a strange array of books to choose from these days. They could read some Lemony Snicket, find old Charles Addams cartoons, or perhaps dip a toe in the waters of F.E. Higgins. I first read an F.E. Higgins book roundabout two years ago when she brought out the delightful The Black Book of Secrets. Then came The Bone Magician which she described as a kind of "paraquel", or story that takes place in the same world and in tandem with Black Book but doesn’t overlap much. 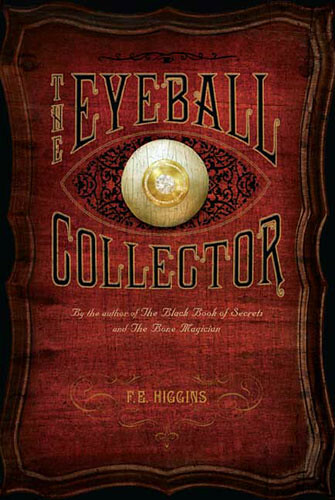 The Eyeball Collector is now the third, and perhaps the best, book in this delightfully twisted series so far. Containing a couple characters from the first two books, this latest book in the series stands entirely on its own and contains a world you might not want to visit personally, but that you’ll gladly reread again and again. Youthful fans of the darkest recesses of the human brain will be inordinately pleased. Be careful what you wish for. You might just get it. Hector Fitzbaudley would have done well to heed that advice. Bored by the life he leads with his well-to-do father and their collection of butterflies, Hector sometimes sneaks across the river to the bad part of town where he can watch life being lived. Yet when a mysterious one-eyed man causes the death of Mr. Fitzbaudley with a little blackmail, Hector vows to track down the villain and take revenge. His plan takes him to the beautiful but poisonous Withypitts Hall, presided over by Lady Mandible, a woman of unique and dangerous tastes. And even as Hector schemes, so too scheme the people around him, until at last he is caught in a web of lies and murder from which it will be difficult to escape. As Hector’s father once said to him, "When you run with wolves, you become a wolf." After reading The Black Book of Secrets I found that what I had on my hands was a book ideal for booktalking. For those of you who aren’t familiar with it, a booktalk is a kind of verbal trailer or preview for a work of literature. Librarians typically get classes of middle grade or high school students then talk up titles in such a way that the kids feel they absolutely must read that book immediately! Black Book was good, but I can tell that I’ll really be breaking out the old booktalking chompers for this new title. Think of all the crazy elements it contains! Death by butterfly, a cat eater, eyeballs for every day of the week, paintings created with blood, riddles, revenge, rescues, you name it! Of course, Higgins’s real strength lies in her delicious writing. Nobody conjures up descriptions like this woman. First there are the names to consider. Names like Lady Mandible, Urbs Umida, Pagus Parvus, the River Foedus, Baron Bovrik de Vandolin, and more. People tend to compare Higgins to Dickens, but I think the comparison is unfair. True she sets her books against a kind of pseudo-Dickensian background and uses funny names, but the stories are far more wonderfully lurid than Dickens. I ask you, how many stuffed gorilla chairs are there in Little Dorrit? Precisely. Case closed. It’s funny but Harry Potter fans may read Hector’s invective of "Tartri flammis!" and fall under the mistaken impression that the boy has just cast some kind of spell. This is the kind of book where Latin is bandied about freely and riddles are in great supply. In fact, in the back of the book you will find the answers to many of the riddles Hector and others tell throughout the book. You will not necessarily know to check for these riddles ahead of time, but if you happen to stumble upon them you’ll be pleased. I was particularly fond of the one involving an innkeeper, ten guests, and nine beds (I still haven’t been able to figure out how it works). It’s not the first butterflies-and-gothic-secrets story I’ve ever read. Truth be told, the books reads as if Higgins was envious of the sordid butterfly world of A.S. Byatt’s Angels & Insects and tweaked it ever so slightly to fit her own nefarious purposes. This, in turn, bring up the question of the readership for this book. What I like about Higgins, though, is that even as she’s conjuring up horrific ideas left and right, she never goes so far that you’d have to call her books teen fare. It’s the suggestion rather than the visceral description that has sway here. Kids reading this book (provided they’ve strong stomachs) should be fine. 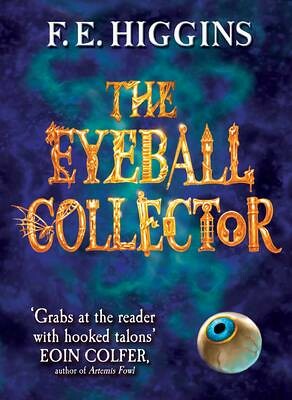 Evocative and capable of enveloping you in another world entirely, The Eyeball Collector has got to simply be one of the most enjoyable books out there. Enjoyable, that is, if you’ve a taste for twisted machinations and even stranger villainy. Your kids won’t be putting this one down anytime soon. Copy: Lent by fellow librarian. I only wish I were kidding. Look here. Here’s what Britain had to offer in the book jacket department. Read a smattering of the opening text here. The website‘s pretty cool. Particularly the recipe part that shows you how to make eyeball-related treats (both savory and sweet). And just in time for Halloween too! And, of course, the inevitable trailer.